An outdoor gear retailer that’s operated in Golden for a decade has opened a second location, this time in Denver. Vital Outdoors opened March 4 at 900 Lincoln St. in Capitol Hill, according to a store employee. The squat one-story retail strip had been completely empty since 2017. Vital Outdoors sells backpacking and camping gear, snow sports apparel, and adventure travel products and footwear, in addition to offering rental gear. Its website said it sells more than 100 brands, including The North Face, Patagonia, Billabong, Camelbak and Chaco. The company, founded and led by Simona and David Livingston, has operated at 1224 Washington Ave. in Golden for 11 years. In 2016, Vital Outdoors teamed up with outdoor apparel brand Toad & Co. to open the latter’s third brick-and-mortar store in Golden. Vital Outdoors manages day-to-day operations at the Toad & Co. store, located down the street from its Washington Avenue location. 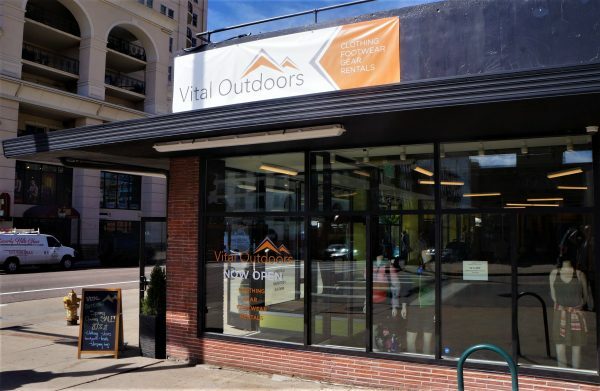 In Capitol Hill, Vital Outdoors joins Evo, which operates a similar concept at 860 N. Broadway. Vital Outdoors opens every day at 10 a.m., according to its website. It’s open until 7 p.m. Monday through Thursday, 8 p.m. on Friday and Saturday, and closes at 6 p.m. Sundays. A dance studio has also signed on to take space in the retail strip.